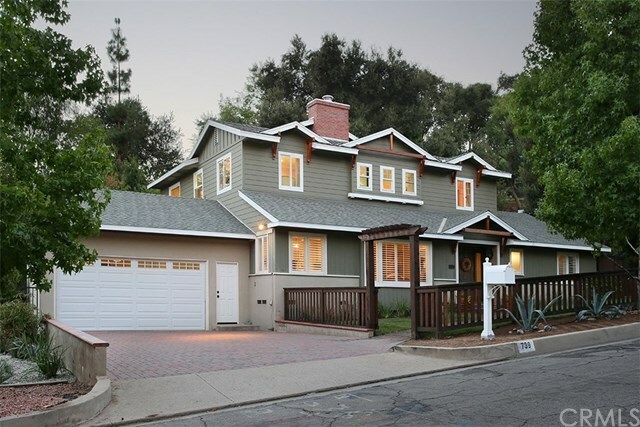 Recently remodeled two story home sited in North Monrovia steps from Canyon Park. The main level features a living room appointed with stone fireplace, dining area, great room adorned with an antler chandelier, expansive kitchen with center island, built-in stainless steel appliances, custom cabinetry with granite counters, apron sink and breakfast area. The oversized master bedroom offers a walk-in closet, bathroom with soaking tub, separate shower and heated floors with French doors opening to the yard. There are two additional generously sized bedrooms and two bathrooms on the main level. The second level has two bedrooms, Jack & Jill bathroom with heated floors, office and laundry room. Other amenities include hardwood and tile flooring, recessed lighting, dual pane windows, custom doors, dual zoned air conditioning system, verdant yard and two car direct access garage with additional laundry hook-ups. Directions: North on Myrtle Ave., East on Foothill Blvd., North on Canyon Blvd.